Eitan, Zohar and Granot, Roni Y. 2009. Primary versus secondary musical parameters and the classification of melodic motives. Musicae Scientiae, Vol. 13, Issue. 1_suppl, p. 139. Liszt's B minor Sonata is now regarded as his finest work for piano, and one of the pinnacles of Romantic piano music. 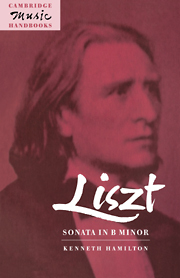 This handbook opens with a survey of Liszt's early attempts at sonata composition - which include some well-known pieces that, hitherto, have been unrecognised as sonata forms - and clears away some of the persistent myths regarding programme music in Liszt's output. In the central chapters, built around an analysis of the B minor Sonata, Kenneth Hamilton discusses various interpretative approaches, arguing that the contradictory writings on the subject stem from the deliberate formal ambiguity of the piece itself - one reason for its perennial fascination, perhaps. The book concludes with a chapter on the performance practice and the performing history of the work, which should be of particular interest to pianists.